I found a brand of chocolate which is as ethically sound as it tasty. Wild Ophelia New Orleans Chilli Chocolate, was my bar of choice when I was browsing in the chocolate section of WholeFoods in South Kensington. 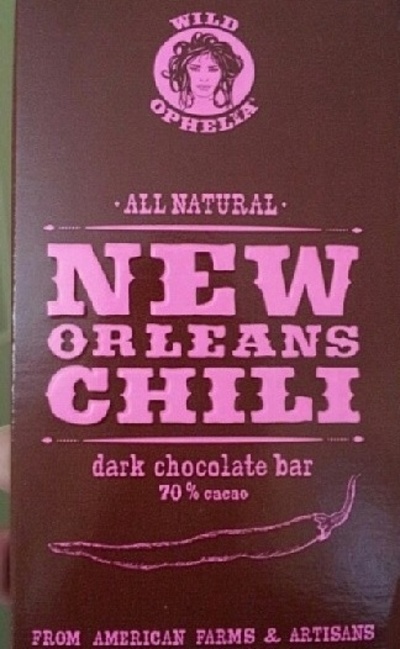 The bar is made of 62% cacao and cayenne peppers. I like to think I'm adventurous, but the idea of cayenne pepper in chocolate frightened and intrigued me at the same time. This chocolate bar certainly has a spicy kick,it's not as strong as I had anticipated, but it definitely has an edge and gives your mouth a little hum, not to mention heat. The chocolate is a good quality dark chocolate, with little in the way of making it unpleasant. I wouldn't eat squares of this alone, but grate a few into a mug of hot milk for Mexican-style hot chocolate, or add it to chilli for an usual kick.